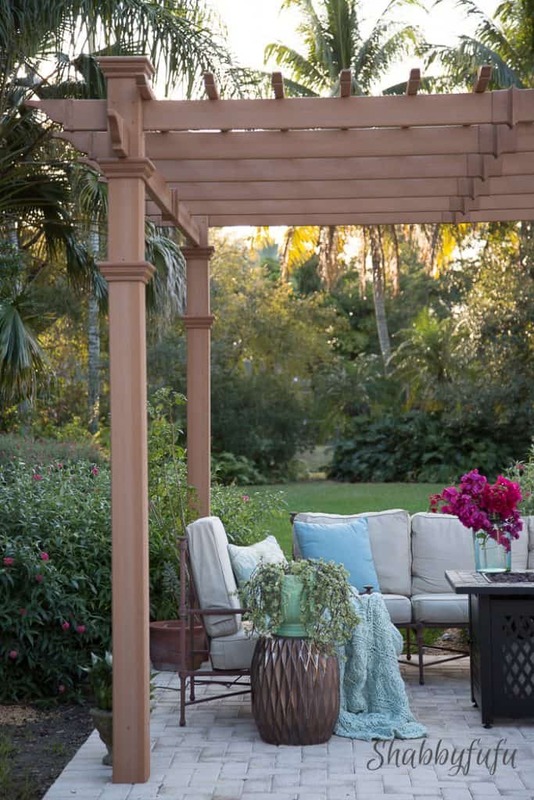 You are here: Home / Decorating / Our New Beautiful and Low Maintenance Pergola! Our New Beautiful and Low Maintenance Pergola! If you follow me on Instagram you might have caught a recent glimpse of this portion of our patio recently and this weekend with our family in town we had the perfect chance to try it out! there are several different ways to go about it. We had a more temporary structure for several years with a kit that had a canvas cover. It served the purpose, but honestly the canvas had to be replaced every year, as it took a beating in the hot summer sun that weakened the all weather top. 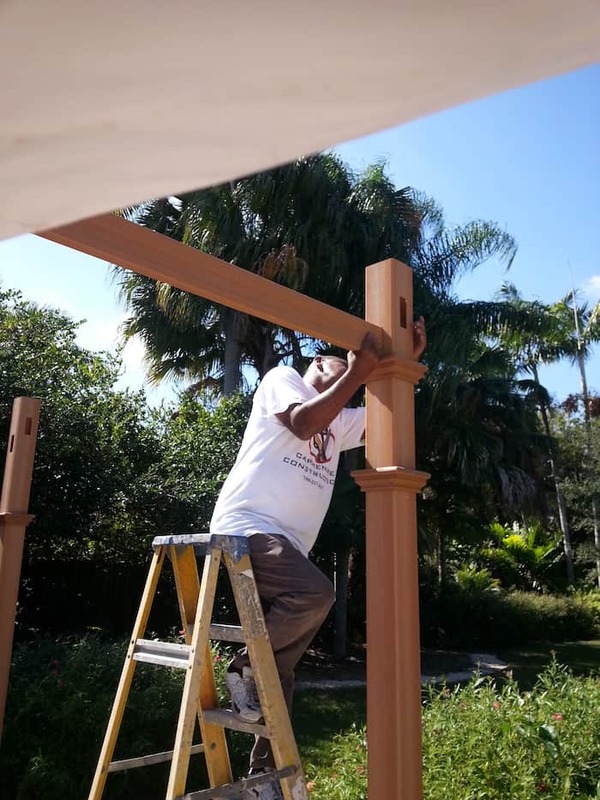 At this point the metal columns had rusted too, so we were ready to take the entire gazebo down and replace, refresh. We live in a hot climate and get lots of summer rain, so wood was not an option. My husband wanted a GAZEBO KIT that he could install without scrambling around with plans to purchase parts. 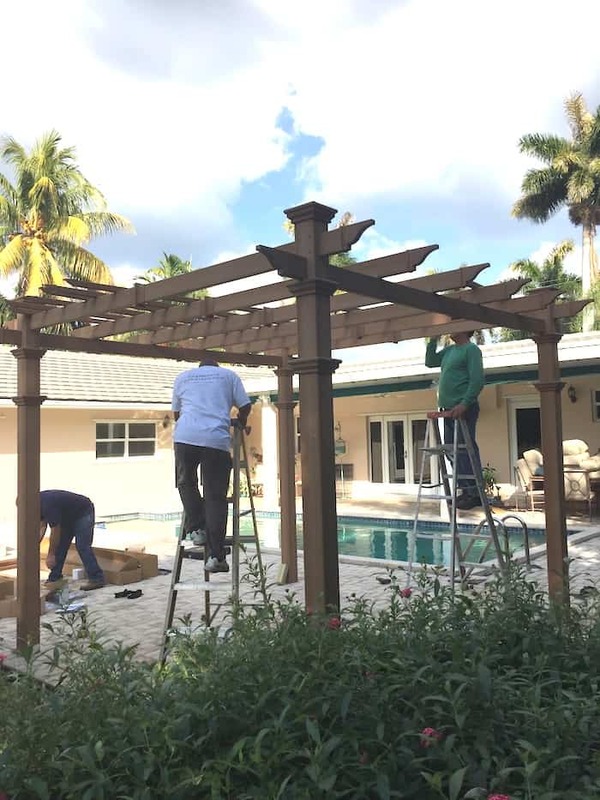 It also needed to be an OUTDOOR GAZEBO of a composite material and one other requirement was that it have the look of wood and not white that would turn yellow with the UV rays. Does this not look like wood? AMAZING and in person you can really see the texture that a real piece of cedar would have! 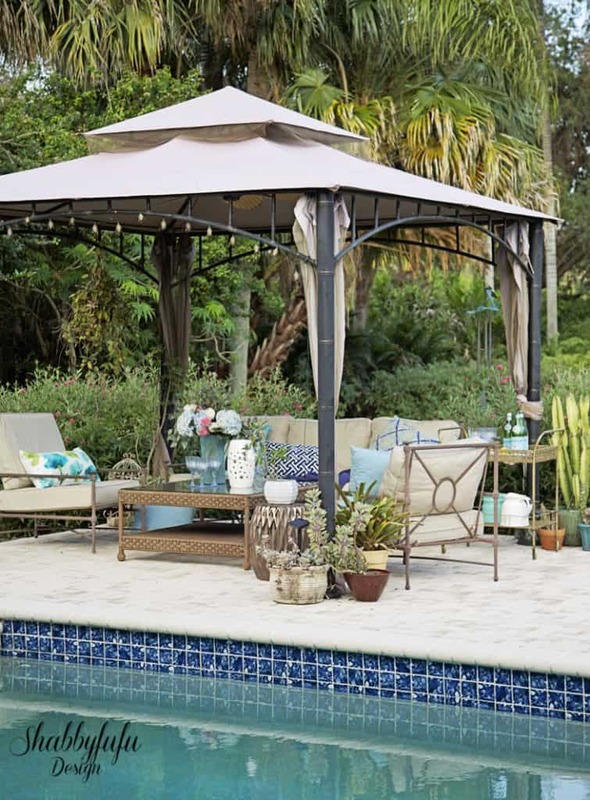 The gazebo is made of a composite and comes all neatly shipped in boxes with everything ready to install right away. 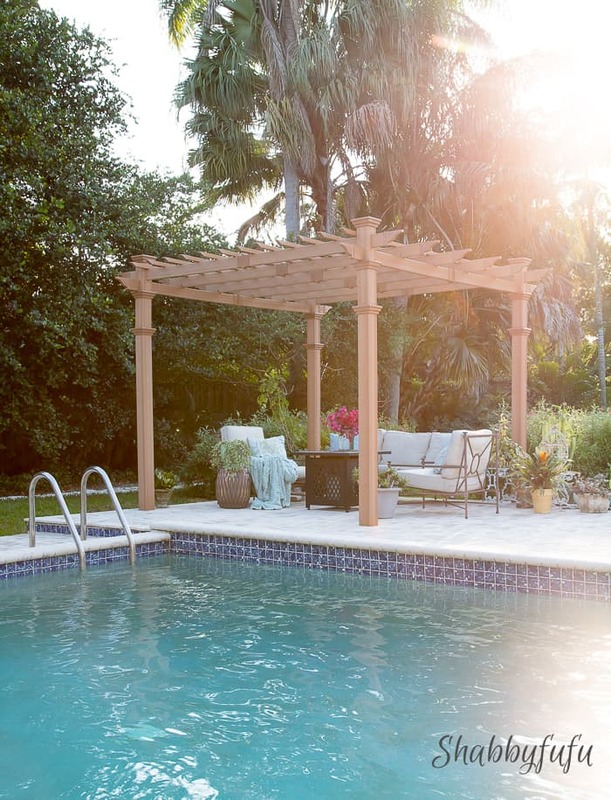 We chose a 10 x 10 kit because with the pool close by we didn’t have room for anything larger. I’m not quite finished with indoor/outdoor drapes to be added and a plexiglass top to keep the rain away. More on those additions soon, but I wanted to let you know about the installation. This would be a DIY project for someone who has help, you can’t fly solo and need at least two people. The instructions included IN THIS KIT were excellent and easy to understand and follow. 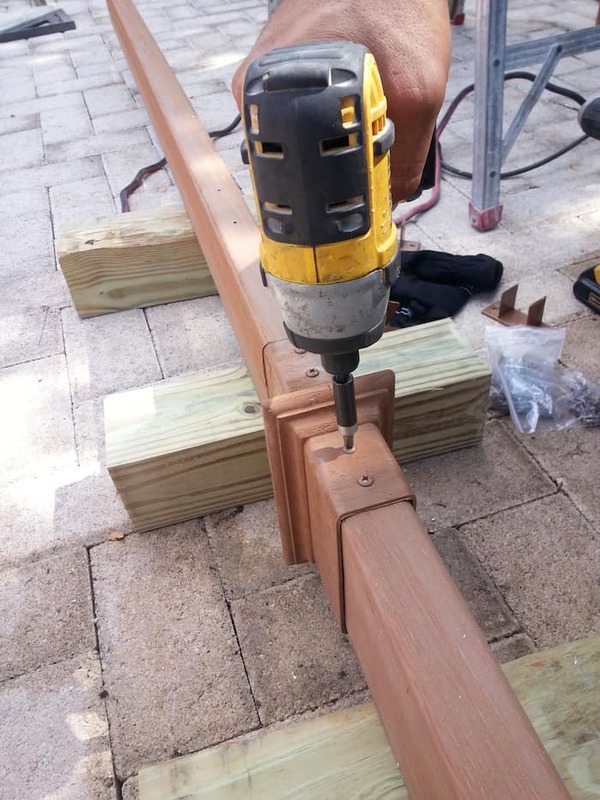 We have a construction business and were very fortunate to have a team of three of our subcontractors put it together for us, but you CAN do it yourself with a partner and a drill. You’ll need a tall ladder to attach the pieces to the top. All of the parts fit together well and we were impressed in knowing that with kits this is not always the case. As you can see, the columns were put together laying on some 2 x 4’s on the ground and then stood up once assembled. 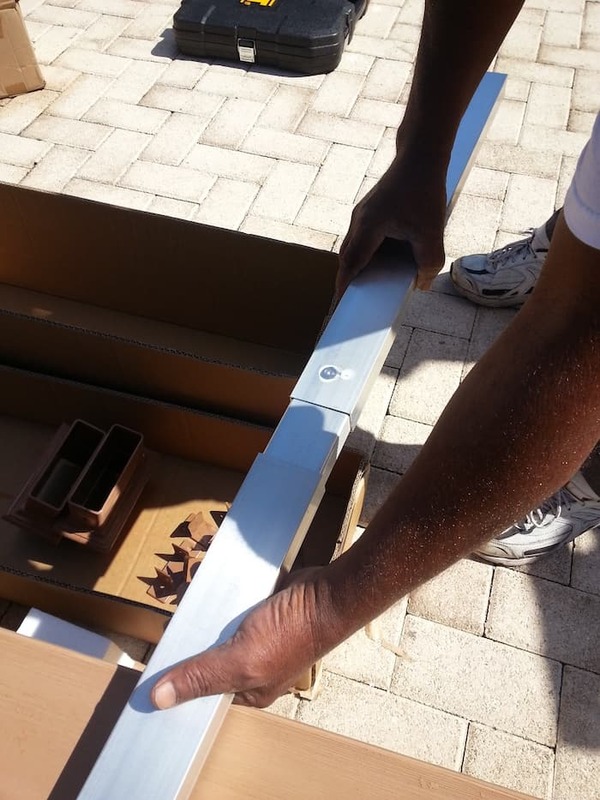 It took our three guys from Carmenate Construction the better part of a day to install this, and since it was on top of a concrete patio it needed to be bolted down with a kit that you can also find on Hayneedle. I really enjoy partnering with Hayneedle because you can find so many things for indoor and outdoors as well. Last year I talked about my family room and how we redecorated it with some beautiful items from Hayneedle in THIS POST. 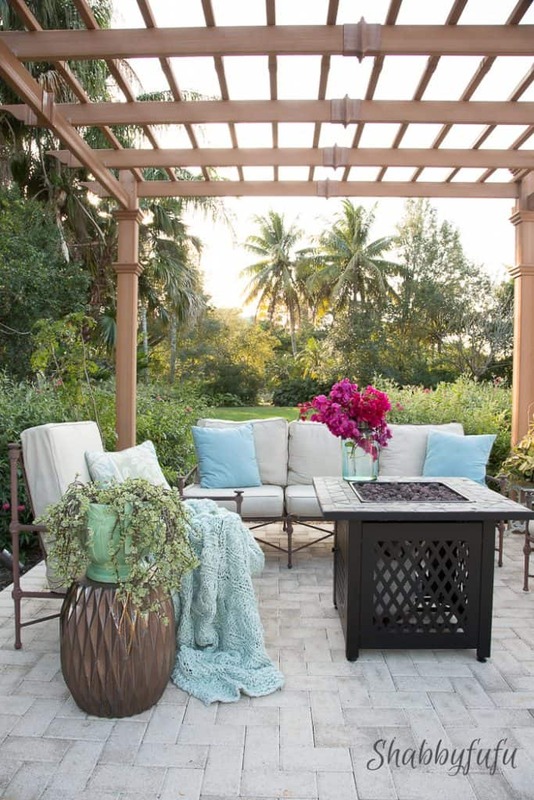 Our patio is the outdoor family room and we enjoy being outdoors as much as we can when the weather permits. 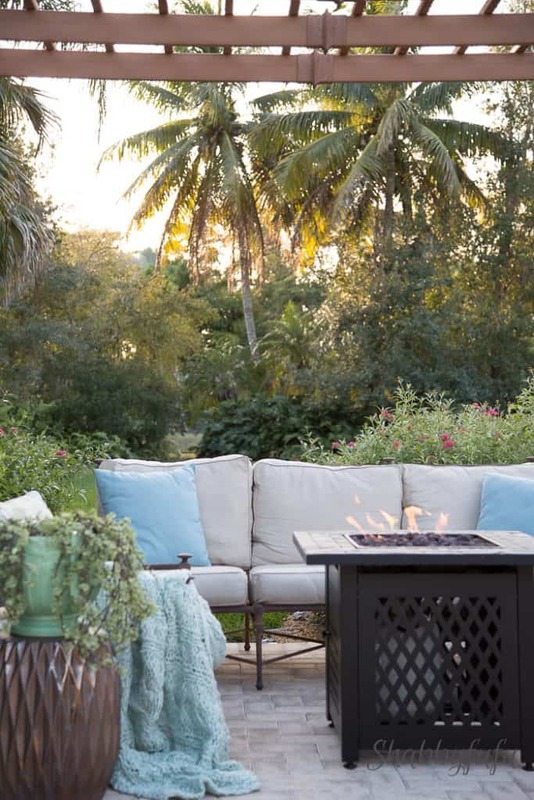 A cozy throw, some bougainvillea from the garden and our new FIRE PIT make it a welcoming spot to hang out or entertain. 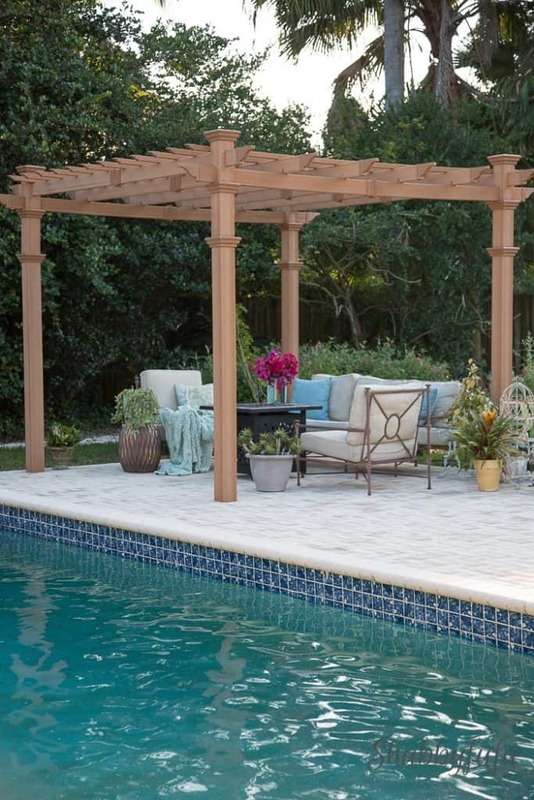 This pergola is so much more upscale and we think it really adds value to our home for resale as well. It’s going to last so much longer than the canvas and metal that is initially less of an investment, but long term cost almost as much with replacement fabric every season. 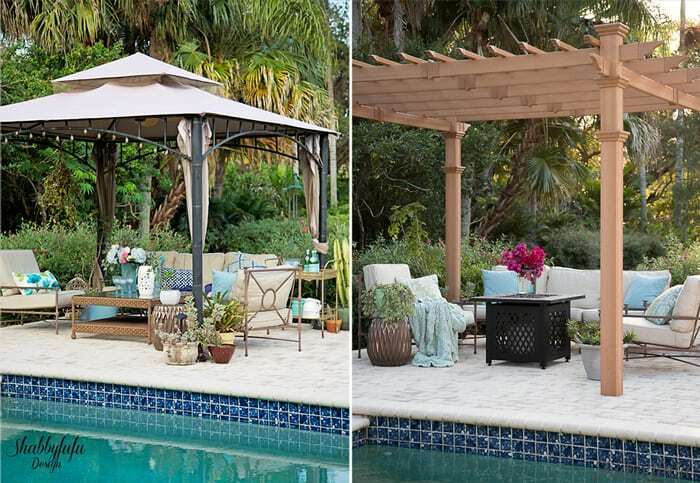 Let me know what you think and I hope that you look around at HAYNEEDLE for some Spring and Summer inspiration ideas! I was provided with the PERGOLA by Hayneedle, but all opinions and experiences are strictly my own.